LG Display has set up shop at the 2015 meeting of the Society for Information Display (SID) conference in San Jose, showing off its latest advances in display technology. For those curious, LG Display will be exhibiting a few unique pieces of display technology, including an 18″ flexible display panel, capable of being rolled up to a radius of just 3cm without affecting any functionality of the display. The company will also be showing off plenty of ultra-large OLED TV panels, but more importantly, LG Display will exhibit a 1.3-inch circular panel, a 5.5-inch curved panel (possibly the same one from the G Flex 2), and a 6-inch active bending panel. The circular panel could inevitably be found on a smartwatch sometime in the future, while the larger 6″ active bending panel could one day be found in smartphones. If anymore exciting news comes out of SID, we will be sure to let you know. Seoul, Korea (June 2, 2015) – LG Display, the world’s leading innovator of display technologies, will showcase the future of display technology at the 2015 Society for Information Display (SID) conference at the San Jose Convention Center from June 2 to 4. SID is the world’s most respected academic association of the display industry, which is comprised of 6.000 leaders in the sector, including executives, academics and researchers, from all over the world. Under the theme of Leading Technology, Great Design & Picture Quality, and Differentiation, LG Display will highlight its exclusive advanced technology and the company’s commitment to deliver the best value to customers. In-Byeong Kang, Senior Vice President and Chief Technology Officer at LG Display, will give a keynote speech on “The Opportunities and Challenges Facing the Display Industry” on June 2. He will discuss the future direction of display innovation based on the fast changing IT environment with the advent of the Internet of Things (IoT) and 5G mobile communications. He will also map out the future technology evolution of LCD and OLED displays and prospects for transparent and flexible OLED displays. LG Display will present three invited technical papers on its cutting-edge research, including the fundamental technology of the world’s first 18-inch flexible panel; new OLED technology concepts for large-size Ultra HD OLED TVs; and Advanced In-Cell Touch (AIT) technology for large-sized LCDs among a total of 20 presentations it will conduct at SID 2015. 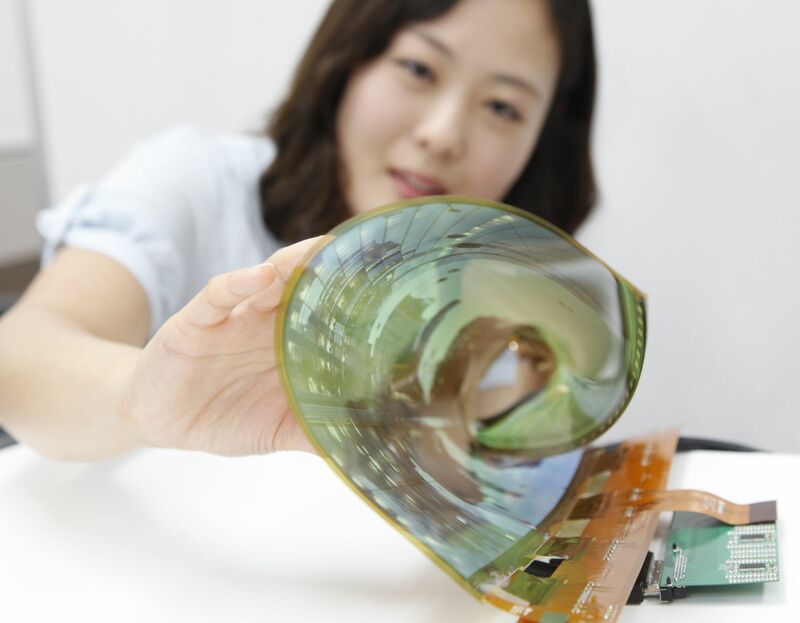 In addition, the 18-inch flexible OLED panel with a curvature radius of 30R, which can be rolled up to a radius of 3cm without affecting the function of the display, will be showcased at the exhibition. The company will exhibit 55-inch, 65-inch and 77-inch UHD OLED TVs, which ushered in the era of large-sized OLED TVs, as well as other OLED products, including a 1.3-inch circular panel, a 5.5-inch curved panel, a 6-inch active bending panel and a 12.3-inch automotive display. LG Display has emerged as the industry leader in the application of the touch embedded technology AIT, which is used in various smartphones and tablets as well as a 15.6-inch notebook display and a 7-inch automotive display. AIT represents a major advancement over In-Cell Touch technology, offering excellent touch functions and a differentiated design advantage with its ultra slim bezel. The company has also developed AH-IPS Plus, an improvement on the conventional AH-IPS technology used in smartphones. The new technology improves transmittance by 20~30 percent by altering the liquid crystal material and UV alignment technology, creating a high-resolution display that consumes less power. LG Display will have an exhibit section to demonstrate to visitors a comparison in power consumption between 5.5-inch FHD and 5.7-inch QHD smartphone displays using AH-IPS Plus with conventional displays of the same size and resolution. The company will also show innovative next generation displays such as a 55-inch high-transparent LCD display with the world’s first 25 percent transmittance, and a 21.5-inch automotive display with 2,000R that can be integrated into the dashboard as a Central Information Display (CID).